Galdhøpiggen/Juvass is on Scandinavia's highest mountain at 2469 metres (8,098 feet). This summer ski resort is open for skiing and boarding in the summer only from 10th May to October, and attracts several international teams. 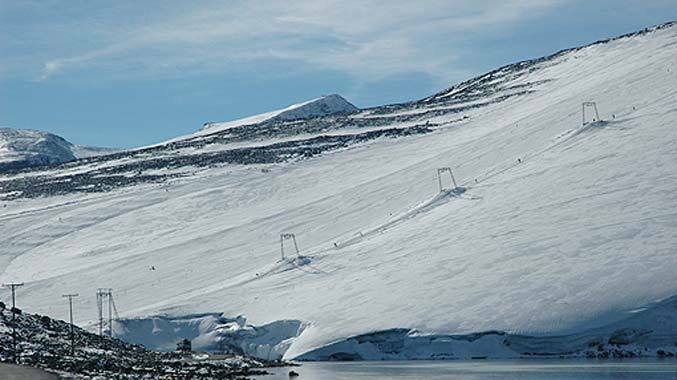 The T bar lifts reach 2,250m (3,739 feet) on the Veslejuv Glacier, from a base of 1900 metres, opening up 1.5 KM (just under 1 mile) of trails over a 350 metre vertical. The mountain is at the gateway to the beautiful Jotunheimen region, the nearest sizable settlement at Bøverdalen, where there is a 38 bed youth hostel. Get snow reports and powder alarms from Galdhopiggen Glacier ski straight to your inbox!